Although the e-commerce economy is expected to continue its upward trajectory and rapid growth, it’s continuing the growth in Bangladesh. This opportunity for success and sustainability is exciting, promising and intriguing as an entrepreneur. Now is the time to get your foot in the door whether you’ve already been involved with the launch of an e-commerce business in the past or are looking to get involved with your first venture. You can only expect to see results while the e-commerce economy is poised for significant growth in the coming months and years. It means that you should follow the critical tips for e-commerce success. For example, if you want to start a new business with very little upfront investment then drop shipping is an ideal solution. Because drop shipping offers an on-demand system, compared to manufacturing your own products or buying in bulk from a wholesaler. But, we’re going to take a look at getting some top tips to start an e-commerce business from scratch so be continued. Owning an own e-commerce business is a dream of many people in Bangladesh. Being set free of a 9 to 5 job and not having to take orders from someone else doesn’t sound all that bad that made them interested to own a business. There is a big rise in e-commerce business for the flourishing of the internet. That’s made it not only possible but easy to start a business on the Internet-based. Because of this anyone can start an e-commerce business and nurture it into a success. But, they need to use the right tools, strategies, and product in place as the success doesn’t come itself. Although it sounds like a broad statement, it’s true. 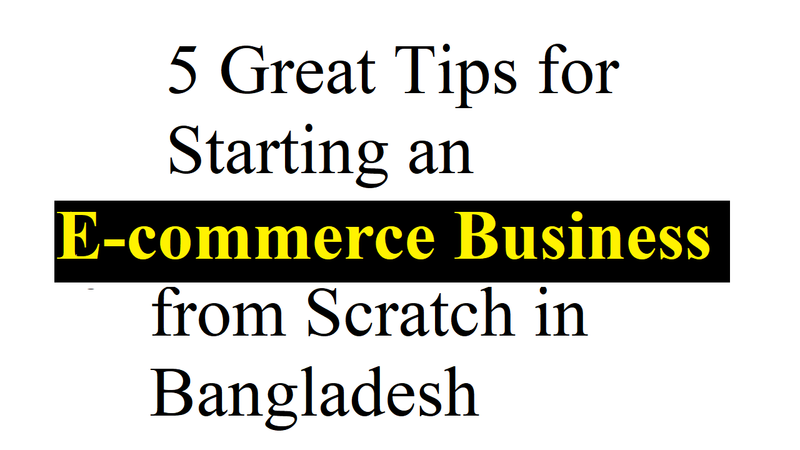 Well, let’s know top 5 tips for staring an e-commerce business from scratch in Bangladesh. As there are all sorts of ways, you can research products online and it’s very essential. Spending half an hour for your brainstorming is needed before you even go near a computer. If you care about the products you’re selling then you’ll find it easier to motivate yourself further down line. And know the needs and wants of your customers, which is the main point of sustainable business. After that, discover what people are searching for in relation to these niche keywords online by heading over to Google’s trusty Keyword Planner tool. When you’re there, you should take notes of keyword volume and competition. But, never forget one thing that catering to niche markets over broader terms is the best chance of success lies there. As we’re speaking of eBay or Amazon, you need to look here next to discover the products that are selling well. So, their chances are the demand for them isn’t very high if people aren’t already buying similar items from Amazon. Also, try to identify where your potential customers are engaging with popular brands in your niche. And it needs to do product research if you want to know your customers’ choices. When starting their first online business is mixing their personal and business finances, that’s a frequent blunder that entrepreneurs make. If you’re ever audited then this not makes accounting more cumbersome and lands you in trouble. While investing a significant sum of money at the outset, it’s absolutely possible to grow a drop shipping business. However, at this point, we would recommend you to rethink it. The greatest successes have always been a result of pitching in and building up the business oneself when attempting both bootstrapping and outsourcing in the past. And your early profits will quickly disappear when you offload significant portions of work to external developers and marketers. So, you don’t have to invest a large sum in inventory all at once according to the whole e-commerce business model. It’s important to decide what you’ll do with your e-commerce business whether you’ll offer luxury pet goods or comic books or something else. Also, before you can make any other decision about your business, you should have a basic idea about the things you want to sell. And things either you’re familiar with or can research extensively are your ideal niches. When you’re more insight, you’ll be more familiar with the industry and success. But, there are a few more things you should keep in mind while choosing and researching your niche. So, keep in mind that there’s an audience for what you’re doing. Because there are some buyers, it’s good to see at least a little competition in a market. On the other hand, there is something more to offer, which is entirely different. And you can do it while having a niche that’s broad enough. As it gives you better focus and is a great way to start to build your brand, niching down is good. Moreover, you could be limiting yourself if your niche is way too small. While setting up an e-commerce store might bring to mind images of having boxes of products on hand in your backroom to ship out. Also, it’s not the only one while that’s one option. The e-commerce businesses have a number of different business models. You’ll want to fine-tune your branding after choosing your business model. It either can and will make or break your e-commerce business while you’re branding your business. Also, if you want the look you want to go for at this stage then you should also have your logo deliberate and start to settle on. But, if you’re selling the exact same product as 15 other competitors then it’s what will make customers keep coming back to you. Because it can even turn a candle into a novelty item, people will love to give as gifts for all occasions. When you’ll brand your business, you finally know who you are.